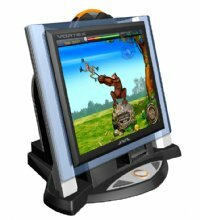 JVL Vortex Countertop Touchscreen Video Game is the future of touchscreen countertops! JVL takes players to extremes with the introduction of the new Vortex. The Vortex has a clear, transparent perimeter framed with beautiful blue-colored LED lights which will capture the attention of anyone, anywhere!! And the revolutionary new "Power Pad" player control adds a very imaginative dimension to countertop play!! Experience brilliant game graphics on a 17" LCD Monitor and a incredible sound system that enhances game play! And the Encore, like all JVL Touchscreen Games uses "Flash Memory" - Which means NO Hard Drives, NO CD-ROMs and NO moving parts to break, unlike the competition, which makes this and all JVL Touch Screens the most reliable countertops made ! PowerPad Control - Experience the joystick plus touchscreen advantage with exciting new games !!! Players love the new performance power of joystick precision coupled with true touchscreen game control. Now more than 150 + Games in over 7 Categories!